Thailand was famous for its production of Ximi (means a rice in Chinese) in ancient times. The syrup of Ximi is sweet and tasty, and is an ideal soft drink for wiping our scorching heat during the summer. But, as a matter of fact, Ximi is not rice at all, let along growing out of the water fields; and it is the marrows of fish-tail palm actually. The young stalks of fish-tail palm are also eligible and are even tastier than shoots. Therefore, wild elephants often damage them in the forest. 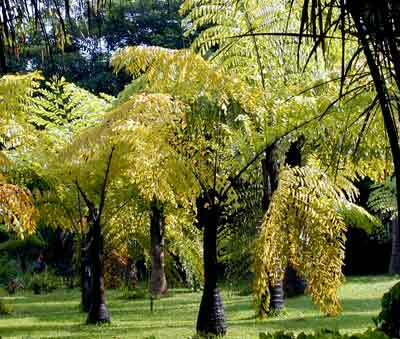 However, fish-tail palm is now specie in danger, and is listed as a Class II protection plant in China. Fish-tail palm is a sort of tall arbor and could grow as tall as 20 meters with a thickness of 50 cm. The shape of the palm is quite peculiar and looks like a vase, and it is also an ideal ornamental plant. Its leaves are as long as 20 meters, with a width of 3-4 meters, and it has the largest leaves in all plants. Its barrel is very hard after taking the marrows out. If we make the barrels into drainage grooves, they could be used for dozens of years. If the barrel is made into chopsticks, they can be sold at very high prices and are only second to chopsticks made of elephant trunks; so, such chopsticks are superb gifts to friends. Fish-tail palm blossoms and fructifies once in its lifetime; it has a lift span of 40-60 years, which is longer than Raphia vinifera.